Our hamster, Laura, died this morning. It was not unexpected--she was at least two years old, which as I understand is ripe old age for hamsters. Carrie and I thought she was the cutest little rodent we had ever seen--until one day we noticed that she looks like every other hamster at the pet store (and almost certainly acts like them, too). Even so, whether we could recognize her uniqueness or not, we can know that she was her own being. 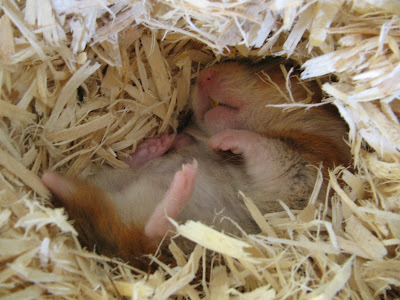 And for a hamster, you could say she led an exciting life. Originally rescued from a burning building and given to me by a volunteer from the local fire department, I acquired her just days after graduating from college. She moved with us three times—first with me to my temporary apartment attached to my cousin’s garage (which prompted me to name her after my cousin's wife), then with us to our rental house in Urbana, and finally to our apartment in Champaign. 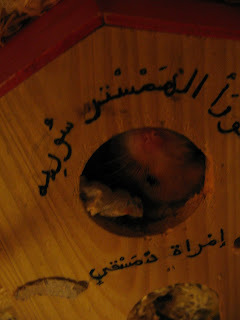 "Laura Lu, Hamster of Syria, Lady of Damascus". (Laura Lu was her nickname). And so even though she's probably like every other hamster out there, she was our sweet little Laura Lu and we'll miss her--and the two of us feel a bit sad today. I'm at least glad to know that she did not suffer for long: Carrie reported last night that she'd seen her shaking a little these past two days, but was otherwise okay (and was even eating and still moving about). As of this morning she was up and walking around but kept falling down. In a final moment, she walked over to her little house, snuggled inside of it, and found some peace. I don't believe in life after death (I do believe that heaven is right here), but as I've started to say recently: if I had to pick an afterlife fantasy to believe in, I'd choose reincarnation--for the obvious reason that I love this world. So to the memory of our enjoyable little rodent: Laura, I hope that you're reincarnated as the animal of your choice. If I can put in a word for being human, of course I cannot recommend anything less... man is the most glorious animal of all. But do know that if instead you choose to be a hamster again, I am somewhat sympathetic--you made it look like fun. And rest in peace, our little creature. 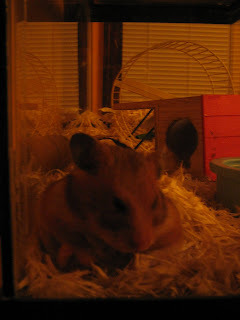 Laura Lu was a lady among hamsters and she was my small furry friend. Laura and I shared an insatiable curiosity and zeal of our surroundings. She had such fearlessness in her that it was inspiring as she would chase the cats around the house as she went on her exploits in her red ball. She was also charismatic, determined, and stubborn. It was her stubborn determination that would drive her to feats of hamster acrobatics as she would attempt to push and pry her way out of her cage. I will miss you greatly Laura Lu. You have taken a part of my heart with you.